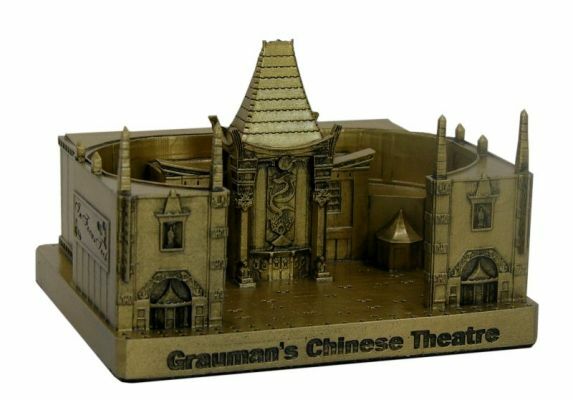 Grauman's Chinese Theatre is located at 6925 Hollywood Boulevard in Hollywood, Los Angeles and was completed in 1926. This building was designed by Meyer and Holler Architects. Grauman's is located along Hollywood's Walk of Fame and it is still used for many movie premiers as well as celebrity parties. This pewter replica stands 2-1/2 inches tall by 3-7/8 inches wide and is finished in antique gold. Nice job Infocus! I was actually here and when I saw this I was so amazed at how close this was to the Infocus piece. Great quality as well as accuracy. This is the most awesome building yet! It is finely detailed and accurate. This is a Hollywood classic! In Focus Tech does great work on all their buildings but this one is exceptional!